Sophie Michaux is Rinaldo and Laura DellaFera plays Almirena. Premiering in 1711, Handel’s “Rinaldo” was the first Italian-language opera written for the London stage, and it was an immediate success. After 1731, however, it fell out of favor — for a good two centuries. It didn’t debut on an American stage till 1975, when Marilyn Horne took the title role. Since then, it’s enjoyed a number of imaginative reconceptions; the 300th-anniversary Glyndebourne revival was set in an English public school. 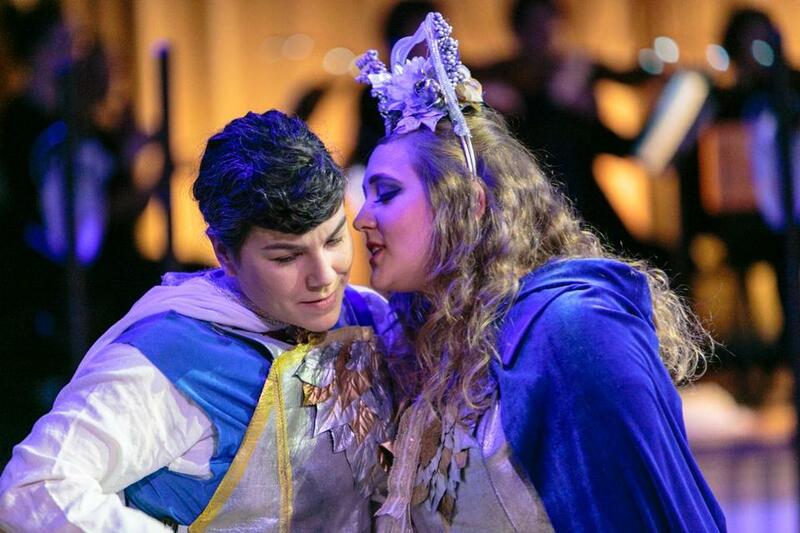 Boston Opera Collaborative’s production at the Benjamin Franklin Institute of Technology, directed by Greg Smucker and Patricia-Maria Weinmann, proves that a “Rinaldo” doesn’t have to be fancy to be good. Taking place at the time of the First Crusade, the story is freely adapted from Torquato Tasso’s “Gerusalemme liberata.” On the besieging Christian side: Goffredo, leader of the army; the knight Rinaldo; and Goffredo’s daughter Almirena, who returns Rinaldo’s love. Opposing them are the Saracen king Argante and his paramour, the sorceress Armida. Over the course of the opera, Armida abducts Almirena to lure Rinaldo into her clutches, but then falls for him, even as Argante falls for Almirena. Eventually the romantic complications get straightened out, Goffredo and Rinaldo capture Jerusalem, and everyone is reconciled. The 1711 “Rinaldo” was as dependent on spectacle as on Handel’s score, much of which was recycled from earlier compositions. BOC manages nicely without special effects. It also does without Goffredo’s brother Eustazio and the Christian magician. (Modern productions tend to play down the religious element; BOC ignores it altogether.) The cast numbers just 10: the five major roles, plus Armida’s four bat-winged Furies and Argante’s Herald. The orchestra, the New York-based New Vintage Baroque, numbers just nine, but on Thursday its graceful, songful playing, with music director Michael Sakir at the harpsichord, was a major element in the production’s success. It also helped that the orchestra occupies the stage while the singers roam the theater floor, with the audience ranged around on three sides. The “set” consists of some 20 coat racks, from which the singers, most of them barefoot, take their homemade-looking costumes during the overture. Subsequently, some of the racks get disassembled for use as swords; others conjure a forest or the pillars of a castle. DellaFera made heartbreaking at a challengingly slow tempo. The production runs two hours (the original ran three) with no intermission. There’s some shuffling of numbers, which does no harm; the only major omission among the arias is Almirena’s singing-bird number “Augelletti che cantate.” It’s through the arias that Handel tells the opera’s real story, and that’s where this “Rinaldo” shines.